Your event will be more visible on YogaTrail, and more people will see it (as it will also appear on the profile of each associated teacher). In the search box that will appear next, please type in the first and last name of the teacher you wish to add and click 'search'-- this could be yourself too! 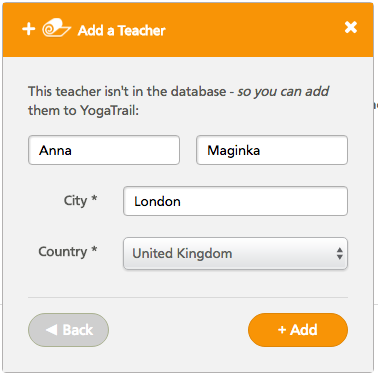 If the teacher you're adding is already on YogaTrail, he/she will appear on the list. Once you see his/her name, just select it, and he/she will be added to your event! You can add more than one teacher, so you can do this for all the teachers taking part in your event. When you add a new teacher please make sure you add their complete name (first and last). There are many thousands of teacher profiles on YogaTrail. 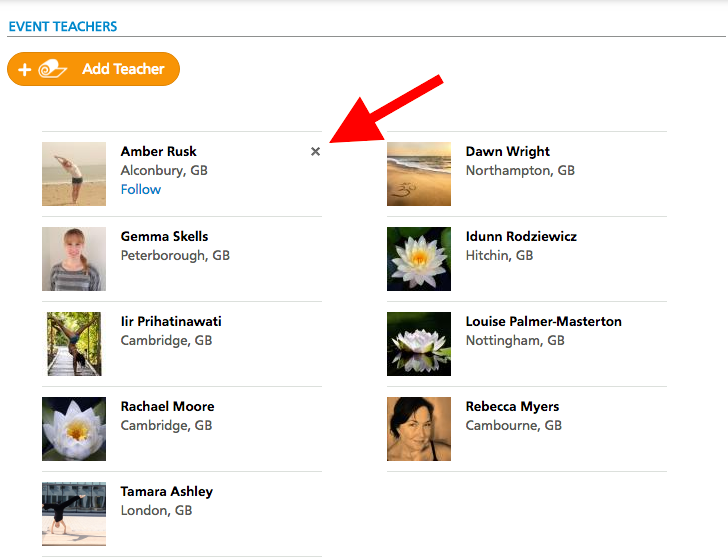 Adding your teachers' full name will allow people to find them on the site. Please note that incomplete entries are periodically deleted. Once you've entered the teacher information, simply click 'Send'. 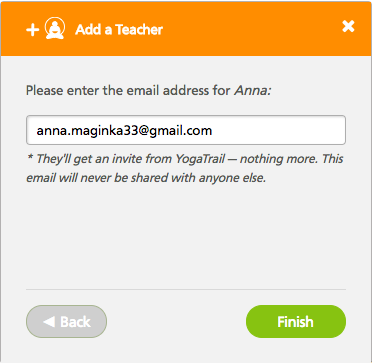 If you don't have the email of the teacher, or prefer not to add it, you can also invite your teachers to join YogaTrail directly and create their own profiles. All the teachers you add to your event will appear automatically in this section. If you've added a teacher by mistake, clicking on the little 'x' will allow you to remove him/her from you event. Once you're done, click 'Next' to move on to the following tab, and finish filling in your event information.